Four of the most common problems rain gutters incur are leaking, sagging, overflowing, and pooling runoff around the house. 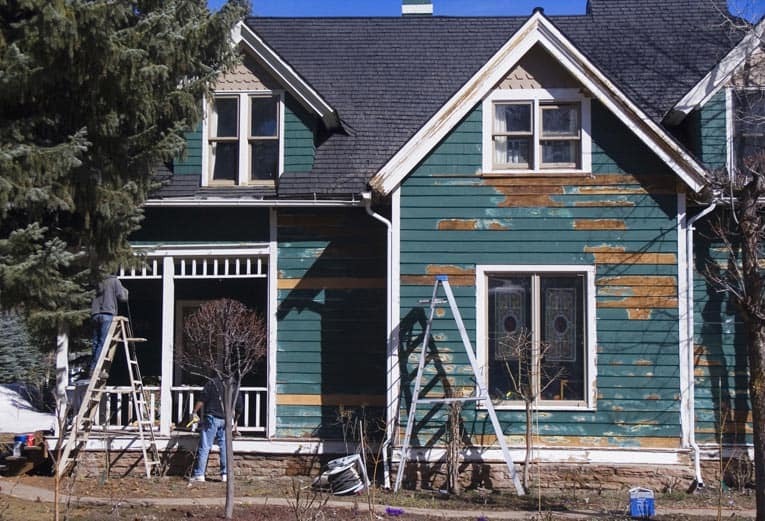 If left unattended, any one of these conditions can cause serious water damage to the house and its foundation. Fortunately, the fixes are within the realm of even a modestly skilled do-it-yourselfer. Note: Please refer to our article on Ladder Safety. If your gutters are leaking, the prime suspects are the joints between sections. Standing water in gutters eventually will rust galvanized steel seams or seep through the seams in aluminum gutters. First check for signs of standing water and sagging. Adjust or add gutter hangers as needed (see more about hangers below). 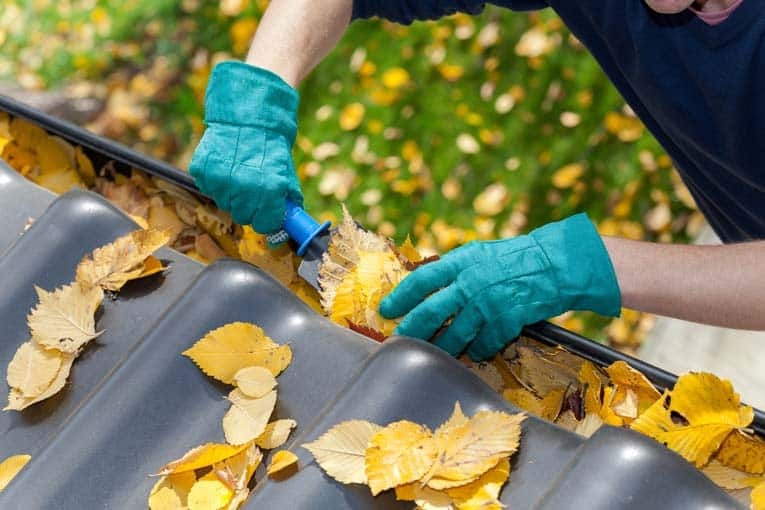 Allow the insides of the gutters to dry out, and brush leaking seams clean. 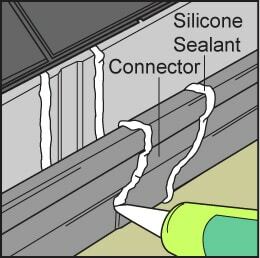 Apply silicone or special gutter caulking compound along the seams on the inside and outside to seal the leaks, as shown above. Patch small holes with roofing cement. Use a putty knife to spread the cement generously around the hole. Try to do this on a warm day, but, if the weather is cool, warm the cement to room temperature so it spreads easily. Repair larger holes in gutters by covering them with patches. Take a sheet-metal patch, embed it in asphalt roofing cement, and then apply another coat of cement over the patch, as shown below. Note: To remove roofing cement from your hands or tools, use vegetable oil on a rag. 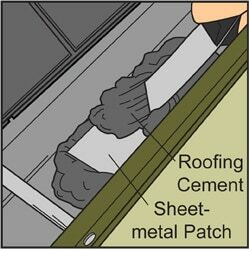 Patch hole in gutter with asphalt roof cement and sheet metal. If your region delivers abundant rainfall, you may want to have your downspout run into a dry well. The well should be a hole 2 to 4 feet wide and 3 feet deep, or a 55-gallon drum—with both ends removed and filled with rocks—that you’ve buried and punctured with holes. Underground drainage pipes should slope to the dry well, which will keep water away from the house’s foundation. Check your local building codes before installing. Gutters that overflow can present serious problems to your home’s walls and foundation. If your gutters overflow during a heavy rain, either the gutters and/or downspouts are clogged, the gutters are sagging and thereby preventing water from reaching the downspouts, or the gutters and downspouts are not large enough to handle the volume of rain runoff. 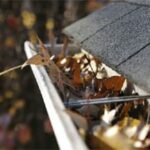 Gutter guards can help prevent leaves and debris from getting into the gutters. For more about these, please see How to Buy Gutter Guards and Leaf Catchers. Mesh gutter guard prevents leaves and debris from entering a gutter. Gutters that sag are a different issue—and the more they fill up with water, the more likely they are to sag because they become so heavy when full. 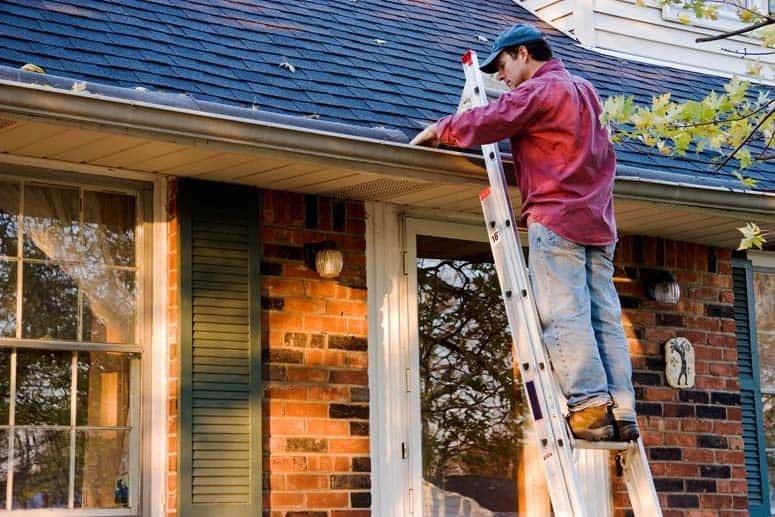 If the gutters overflow but are not sagging or clogged, you will probably need to install new, larger downspouts and gutters. When full of water, rain gutters can become extremely heavy. As a result, the types made of flexible materials such as aluminum, vinyl, and galvanized steel can begin to bend and sag and their hangers to loosen. As this happens, they cease to do a good job of draining rainwater efficiently, allowing water to pool along their lengths. This, of course, just exacerbates the problem, making them heavier and causing them to sag even more. To determine if your rain gutters sag, check for signs of standing water or water marks along the inner sides of the gutters. Using a bubble level, check the slope—gutters should drop about 1/4 inch for every 10 feet of run toward the downspouts. 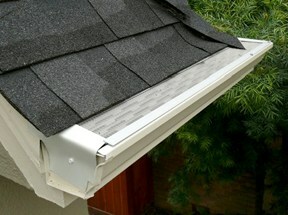 To fix a sagging gutter, you may need to replace the hangers or, at the very least, re-seat them. 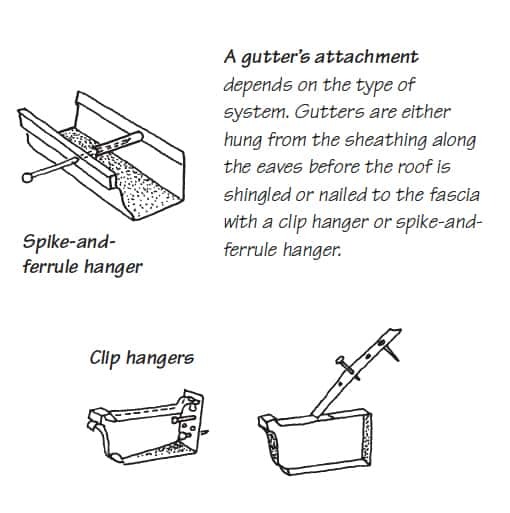 If the gutters are held by spike-and-ferrule hangers, use a hammer to drive the long spike, making sure it goes into solid wood. If it does not grab securely, you may need to replace it with an even longer galvanized nail or, better yet, a long screw. To tighten clip-style gutter hangers, you will need to lift the roofing material along the eaves and refasten the hangers to the sheathing. Be careful not to crack or create holes in the roofing. Take the sections apart and clean out the debris. 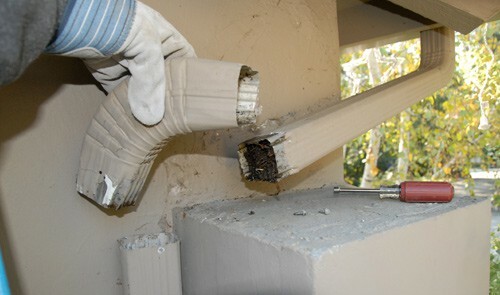 For a clogged downspout, disassemble the elbow and clean out the debris. Then, to refasten them, push the downspout sections and/or elbows together, drill pilot holes if necessary, and fasten them with two 3/8-inch #8 galvanized sheet metal screws. (Don’t use longer screws because debris will hang-up on them.) Be sure the anchor straps that hold the downspouts to the wall are secure. The best way to do this is to use a downspout diverter. These simple devices fit onto the bottom of downspouts and, as in the case of the one shown here, unfurl to carry water several feet away from the house. 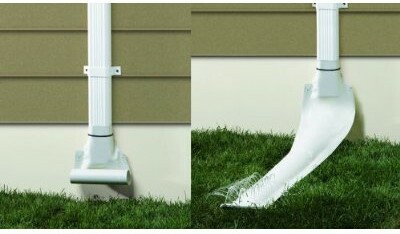 Called an “automatic recoiling downspout,” it is a simple and inexpensive device. Automatic recoiling downspout diverts water away from house when it rains, then rolls back up. Another option is to bury 4-inch-diameter ABS drainpipe under the ground, but keep in mind that this may clog up over time.